How many presentations have you attended that could have been delivered more effectively as an email? The speaker unleashes a tidal wave of PowerPoint slides with graphs and charts going every which way. It’s hard to pay attention. They rarely ask questions or solicit feedback to involve the audience. To add insult to injury many speakers will read the slides. You don’t have to be that person! Follow the suggestions below to get your audience involved and help them pay attention to you! Yes, you need to plan audience interaction in your presentation. I would recommend 10-20 minutes. Why? Because attendees stop paying attention after 10 minutes AND your presentation is probably the third one of the day. They can only take so many graphs and charts. If you can get them to consider rhetorical questions, participate in small group conversations or ask you questions, then you will win. For audience interaction – speakers should inspire the audience to act. When we looked at the reasons people attend conferences words like Try, Share, Meet and Discuss bubbled up to the top. Along those same lines the key audience participation words are ask, answer, poll, rank, vote, play, capture, collect, discuss, display, share. Notice: “sit and listen” are not on the list. These are the actions that you can inspire your audience to take. If your audience could answer questions for you as quickly as Google – what would you ask them? What questions should they be asking themselves? Here are 10 questions senior leaders should be asking but are afraid to ask. A feedback loop is a way to take all of the small engagement conversations and bring them back to you the speaker. This might be through live polling results, conversation recaps, Q&A, word cloud or some other technique. For example, sometimes speakers ask the audience to discuss a ___________ that ____________ (example: discuss a leader that inspires you). Then, attendees form groups of 2-3 and talk for a few minutes. Where does that conversation go afterward? Is the information fed back to the audience? Or do they keep it themselves? Savvy presenters will ask someone to share these conversations. If you have a large audience, then live Polls and Interactive Q&A would be a great way to get people involved with you. If your event is not providing an event app, then you may consider an audience response app to scale up your audience participation and attendee engagement. There are several options available and most have a basic interactive Q&A and Live Polling feature. Also, these audience response apps have live results displays so you can create a feedback loop. Yeah! If you don’t know how to use the technology read this guide: How to Prepare Your Speakers to Use Audience Response Apps. Don’t let your next presentation be a tidal wave of PowerPoint slides. 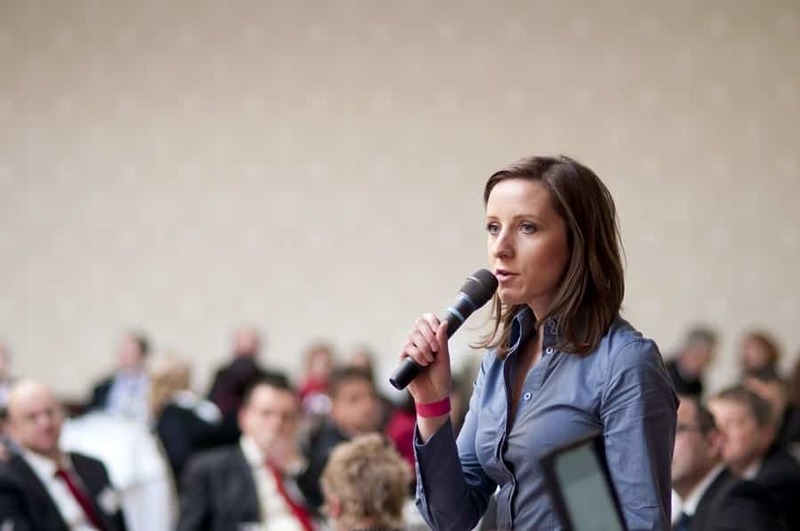 Incorporate 10-20 minutes of audience participation activities into the presentation. We promise that you will see the results in your post-event feedback forms. Have an awesome next event! If you’d like to see more about how you increase audience and attendee engagement in your events and trade show booths with our interactive games and event apps, feel free to contact us with questions or to discuss your event with one of SocialPoint’s Digital Strategists. We’ll help you generate more fun, excitement, and results.